Fall seems to be everyone's favorite time of year. The air is clean and crisp and the sky is a clear shade of blue, which provides a nice background for the season's best color producers-leaves. While central Florida isn't known for its fall colors, we do have several native trees that put on a good show. Red maple (Acer rubrum) grows to 60 to 70 feet tall. It is found throughout Florida in swamps, floodplains and hammocks and does not tolerate dry sites. The trunk is brown and rough and the upper branches are silvery. Small red flowers appear from December through January followed by bright red winged fruit from January through February. The four to six inch long leaves have three lobes and serrated edges. They are medium green on top with silvery undersides. In fall, they turn yellow red or purple. Sugarberry (Celtis laevigata) grows to a height of 60 feet. Except for the Keys, it is found throughout the state and occurs naturally in low, wet areas but can adapt to other conditions. Trunks of the sugarberry are pale gray and smooth and may have warty outgrowths. The greenish flowers appear singly or in small clusters. Orange to reddish-black 1/4 inch round fruit appear in the fall. The fruit is sweet giving it the common name of sugarberry. The two to four inch leaves are alternate, oblong, pointed and can have smooth or widely toothed edges. In the fall, they turn pale yellow. Persimmon (Diospyros virginiana) reaches a height of 50 feet. It is found in north and central Florida in old fields, woods, fence rows and road edges. The trunk is brownish gray to black with a block-like pattern. Fragrant greenish-white flowers are dioecious (male and female flowers are on separate trees). Edible yellow orange fruit is round, 1 1/2 inches in diameter and need frost to ripen. The oval leaves are pointed, alternate and are glossy dark green on the top and are pale green underneath. They are usually yellow green in the fall, but some may be reddish purple. Sweet gum (Liquidambar styraciflua) grows to a height of 80 feet. It is found in north and central Florida in upland and lowland woods, preferring moist to wet acidic soils. The genus name means ' liquid amber' which refers to the yellow liquid that seeps from the trunk when the tree is injured. And the common name also refers to this sweet smelling sap. The trunk is straight and has brownish-gray interlacing bark. Female trees have 1/2 inch green ball-like flowers. Male flowers are in three to four inch upright racemes. Brown ball-like woody fruit is one to 1 1/2 inches in diameter. The leaves are star shaped, six inches long (and approximately as wide) and are glossy dark green and aromatic. These leaves turn yellow, red, orange or purple in fall. Black cherry (Prunus serotina) grows to be about 50 to 60 feet tall. It is found in north and central Florida in abandoned fields, beneath power lines and along fence rows. When the tree is young the trunk is brownish, shiny and smooth. The reddish brown plates of bark form a patchwork when the tree matures. In early spring, white flowers appear in four to five inch long drooping spikes. Red to black 1/4 inch round fruit ripen in July and August and attract many birds. The alternate leaves are oblong, shiny dark green and are three to five inches long with a sharp point and toothed edges. They turn yellow and red in the fall. Florida maple (Acer saccharum) is a small tree reaching a height of 25 feet. It can be found in north and central Florida along swamp edges, moist stream banks and upland woods. The trunk has grayish brown bark that is rigid. Appearing in spring are clusters of greenish-yellow bell-shaped flowers. The leaves are opposite, medium green, three to four inches long and have three to five squarish lobes. The Florida maple has beautiful fall color turning bright yellow to salmon. 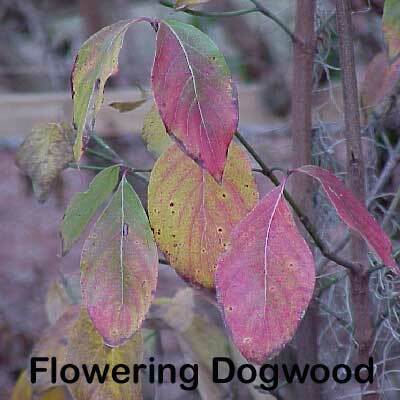 Flowering dogwood (Cornus florida) grows between 20 to 30 feet tall. It is found in north and central Florida in well drained woods. Young trees have trunks that are smooth and grayish green. Older trees have a checkered gray bark. Tiny greenish-yellow flowers are surrounded by four showy white bracts that are three to four inches across. These bracts are often mistaken for the flowers. They appear from March through April and last 10 to 14 days. Birds love the 1/3 inch bright red oval fruit. The leaves are opposite, oval, pointed, are four to six inches long and have smooth edges. In fall, these leaves turn purplish-red. Sorrel tree (Oxydendrum arboreum), with its slow growing nature, reaches a height of 30 feet. It is found in north and central Florida in ravines, bluffs and well-drained hills and prefers acidic soil. The trunk can be singular or multiple with reddish-brown to black bark that is deeply cut. Appearing in early summer are drooping panicles of white bell-shaped flowers. These fragrant flowers are 1/4 of an inch across and the panicles can be 10 inches long. Yellow to brown capsules stay on the tree throughout winter. The leaves are oblong with pointy tips and finely toothed edges, dark green and shiny on top with paler undersides. This tree provides long lasting fall color with the leaves turning yellow, red or purple. Sassafras (Sassafras albidum) grows to a height of 40 feet. It is found throughout the panhandle and north Florida (south to Citrus County) along fence rows, edges of woods and abandoned fields. Preferring acidic well-drained soils, it is adaptable to other conditions. It may be clumps forming. The bark is reddish-brown and deeply indented. When crushed, the bark smells like root beer. Appearing in spring are racemes of yellow flowers which are about one to two inches long. Male and female flowers are on separate trees. Blue-black fruit (which appear on the female trees) ripen in the summer. The stalk that bears the fruit is bright red. The leaves are four to seven inches long and two to four inches wide. Leaves within the same tree can be oval and mitten shaped often with three lobes. This tree is known for its spectacular fall color with the leaves turning shades of yellow, orange, red and purple. If you do not have room to add more trees, there are several shrubs with great fall color. Sweet shrub (Calycanthus floridus) grows to a height of seven to eight feet. It is found in north and central Florida in rich moist soils and it will not tolerate dry conditions. This shrub is multi-stemmed with brownish-gray bark. Smelling like sweet strawberries, are two inch reddish-brown flowers that appear in March. The leaves are three to five inches long, elliptic and pointed. They have a rough texture and are dark green above and fuzzy, gray green beneath. In autumn, the leaves turn yellow. Summer sweet (Clethra alnifolia) averages a height between four and seven feet. It can be found in damp acidic soils and pinelands in north and central Florida. Appearing in July are three to six inch vertical spikes of 1/3 inch white flowers that are fragrant. The leaves are two to four inches long, alternate, oval and pointed. They are smooth or slightly fuzzy underneath and turn yellow to orange in fall. Oakleaf hydrangea (Hydrangea quercifolia) reaches a height of six feet. It is found along streams and in areas with moist, rich soil in north and central Florida. It is multi-stemmed and has a suckering habit. Upright panicles of one to 1 1/2 inch flowers appear in summer and are white, pink or brown. The oak-like leaves are three to eight inches long and have three to five lobes. They are dark green on top, white to brown underneath and are fuzzy. It turns red, orange or purple in fall. Virginia willow (Itea virginica) is about three to seven feet tall. It grows near creeks and rivers in moist soils in north and central Florida. But will tolerate drought. Appearing in late spring are 1/2 inch fragrant white flowers in three to six inch long spikes. The elliptic leaves are two to four inches long and glossy dark green. They have long lasting fall color turning scarlet, crimson or purple. Leatherwood (Cyrilla racemiflora) reaches a height of 15 feet. It is found throughout the state in swampy acidic soils, but is drought tolerant. Appearing in June are 1/4 inch fragrant white flowers on five inch long spikes. The oblong leaves are three inches long and are glossy green. It is semi-deciduous and turns orange and scarlet in the fall. Virginia creeper (Parthenocissus quinquefolia) is a vine that reaches more than 50 feet. It is found throughout Florida in any site and light condition. Appearing in spring are panicles of yellowish-green flowers that are hidden under the leaves. Birds are attracted to the black, 1/4 inch, fruit that appears in fall. The leaves are palmately compound with five leaflets that are two to four inches long, medium green on top and paler underneath. When growing up a tree Virginia creeper offers brilliant red and purple fall color where there otherwise wouldn't be any. We may not have the vibrant colors that are in the north, but we do have more than just green. Drive west on Route 50 toward Bayport for a wonderful fall display. Nelson, Gil. The Trees of Florida. Pineapple Press, Inc. 1994.